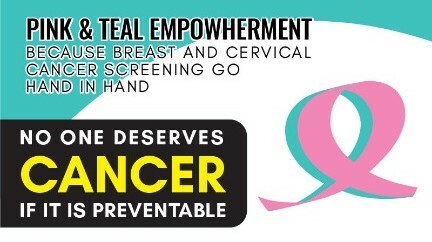 I'm making a difference by raising money for women to get adequate breast and cervical cancer screening. Something so dear to my heart. Please support me by donating. Pink & Teal EmpowHer (Persatuan Kesedaran Kanser Wanita) is a non-government charity organization, which aspires to increase awareness and screen women for breast and cervical cancer irrespective of race, religion, cultures and boundary. We aim to provide screening with utmost compassion, professionalism and care. We form groups of volunteer non-medical and medical students, personnel and clinical specialist to the rural women of Sarawak to offer them adequate breast and cervical cancer screening. We employ the VIa technic, a simple and cost-effective method of cervical cancer screening shown to be equal if not superior to the Pap Smear with immediate results to reduce drop out in follow up rates.